Rosanne thought she had just a pulled groin muscle back in August of 2018. She worked through the pain – keeping at her normal, daily activities – until October, when it became too much to handle. An MRI revealed Rosanne had fractured her hip. Before her surgery, Rosanne looked most forward to being able to play with her puppy again. She had mentally prepared herself to be off from work for about three months, but was surprised to hear that she would be back to work just two weeks after her surgery. The effects of surgery were immediate and, just one week after surgery, Rosanne no longer needed her walker. 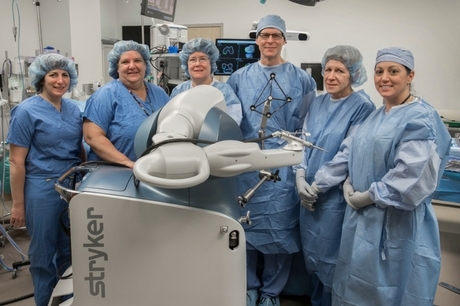 Mako is a robotic surgical arm that can perform partial or total knee replacements and total hip replacements. By using CT scan information, the system can create 3-D images of the joint and help doctors plan for the surgery. During the surgery, doctors can use Mako to prepare the bone, introduce the implant and ensure that it is balanced and fits well. 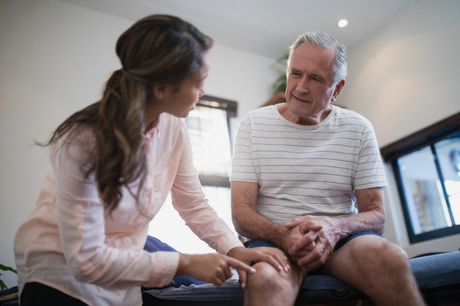 Geisinger’s orthopaedic team specializes in treating a wide variety of bone, muscle and joint injuries and issues, including chronic joint pain, including hip pain and knee pain. 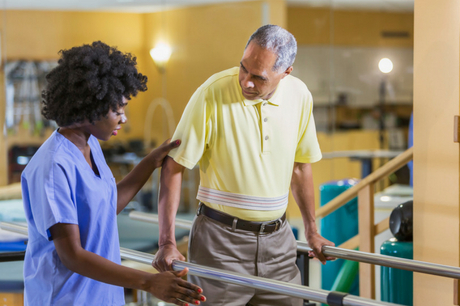 Backed by the expertise and innovation of a nationally-renowned healthcare system, our skilled orthopaedic specialists provide personalized care and leading-edge treatments to help patients experience less pain and faster recovery. Wondering if you might be a candidate for Mako® robotic-arm–assisted joint replacement surgery? Learn more and download your free guide. Rosanne Hartland plays with her puppy after a full hip replacement with Mako® robotic-arm–assisted joint replacement surgery. Interested in learning more about treatment for joint pain? Learn more and download my free guide.